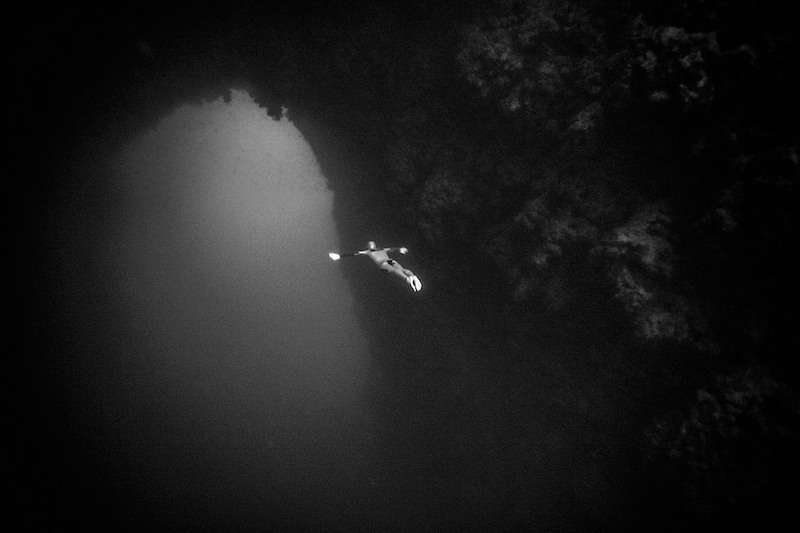 On June 1, 2007, ten years ago today, I achieved one of the biggest athletic challenges of my life: Swimming through the famous Blue Hole’s Arch in Egypt, on a single breath of air, without fins, breast-stroke style. For those of you who are not familiar with that location, the Arch is a natural geological occurrence, referring to a submerged 30-meter (98 ft) long passage through the reef wall between the Blue Hole and the Red Sea at a mere 60 meters of depth (197 ft). Before I swam it, it had only been done with equipment (fins and or extra weights). I was the first to do it relying solely on my own propulsive power. On April 1, 2007, I had attempted the constant weight no-fins world record in Hawaii (diving down and up breast-stroke style). However during the attempt to 81 meters (266 ft) I experienced heavy current. The current slowed my decent down and my ascent back up by more than a minute, from an expected dive time of 2:40 to 3:45. Consequently, I suffered my first ever black out and I was devastated. I had prided myself – and still to this day – on my ability to know when to abort a dive. During the rescue some salt water got into my lungs so I was unable to get back in the water for several weeks. To say that I left Hawaii with my confidence shattered is an understatement. Shortly after, I underwent four root canal treatments on a single tooth to remove a tumor in the root that had started to spread. Probably one of the most painful experiences with a dentist ever!!! Late May 2007, when I arrived to the Blue Hole in Dahab I was there to explore my sensations during my dives and start the process of getting back into depth. I had not gone there to do the Arch – as the possibility of crossing it was not something that left me brimming with confidence. The dark cloud of my black out in Hawaii was very much hanging over my head. Initially I dove on the reef and in the shallows. When I dove on a line to around 25 meters, I experienced the excruciating pain of the scar tissue from the recent dental procedure. Under the pressure it felt like being stabbed in the face. I knew that in order to release the scar tissue I had to push past the stabbing searing pain, and a variable-weight dive to 65 meters did exactly that. Freed from the pain and after some consideration my dear friend and free diving champion Natalia Avseenko asked me to do the Arch with her. She would do it with a mono in and I would do it without any fins. I decided to attempt the record dive. To be honest, as I descended towards the Arch, around 25 meters I got contractions in my diaphragm (the urge to breathe). They were coming on because I was not at all relaxed, still wrestling with the dark thoughts from months before. I knew if I aborted the dive I would probably not be able to get past this mental challenge. I also knew that if I was not successful it could at worst, cost me my life and at best, would most likely finish my career since I was not certain I could come back from back to back failure. In the end, I successfully dove 60 meters down and swam 30 meters across the Arch. Once I exited the submerged passage, the 60 meters swim back was long and my arms were burning from the lactic acid build up. My first thought when I reached the surface on the other side of the reef was “dang, I am hungry”, those of you who know me well won’t be surprised in the least. My second thought was the elation that comes from knowing that I had achieved a world’s first, a record that could never be repeated or broken. Being the first to do something that was deemed impossible renewed my confidence and fuelled my desire to continue to explore my limits and to attempt future records. It was one of those pivotal moments in my career and I am forever grateful to those that supported me during that dive: Natalie Avseenko, Michèle Monico, Fred Buyle and Patrick Schnorf.